Aston Villa V Arsenal - view commentary, squad, and statistics of the game live. Goalkeeper Wojciech Szczesny is confident Arsenal's mean defensive streak can see them stay ahead in the race for the Barclays Premier League title. The Gunners will set out to return to the top of the table when they travel to Aston Villa on Monday night. Since shipping six at Manchester City last month, the Arsenal rearguard have been breached just once, at West Ham on New Year's Day, to restore their status of holding the best defensive record in the top flight. Szczesny is scheduled to return between the posts at Villa Park having been rested for the 2-0 FA Cup win over Tottenham last weekend. And the 23-year-old Pole, who has kept 14 clean sheets in all competitions, feels there is growing confidence in a back line which has developed into an effective unit - no matter what the personnel. "I prefer to play behind the same back four because we have got a very good understanding, but you have to give credit to the players that have come in, when everyone does as well as they been doing recently it really doesn't matter," Szczesny said. "Thomas Vermaelen has done really well when he has been in the team as have the others, like Nacho Monreal and Carl Jenkinson. "As long as the players coming in are in good shape and bring in the same principles into the game, it doesn't make much difference. "Hopefully they can maintain that form because the amount of clean sheets we have kept lately has made me very happy." Szczesny added in the Arsenal matchday magazine: "Clean sheets or something we have always wanted to improve because over the last few years we haven't been the strongest in the league defensively. "Last season we improved a lot, but I think now we are showing much more consistency in our defending. "There is still room for improvement, but I have to credit the defenders and the shape of the whole team." The current Arsenal defence may not yet have earned legendary status as the one which drove Wenger to his first Double in 1998 or on which the Invincibles of 2003/2004, but the French coach feels the foundations are promising. "We had a very stable and solid defensive record since the start of the season, with two blips - one was against Villa in the first game and one was when we played at Man City," he said. "But overall our defensive record has been absolutely top and that is what we want to keep until the end of the season, and even improve." Arsenal have a superb record at Villa Park, where they were last beaten in the Premier League back in December 1998. Monday's trip to the Midlands will also present an opportunity for the players to lay to rest their 3-1 home defeat by Paul Lambert's men on the opening day of the season which sparked much criticism of the direction Arsenal where heading. Wenger, though, insisted: "It is not about revenge. "The opening day of the season is not Villa's fault, and what happened after the game is not Villa's fault. "We just had to face dissatisfaction from people and our fans, that was completely normal. "Villa is just another game. What is always important is the next game and to produce a good performance." 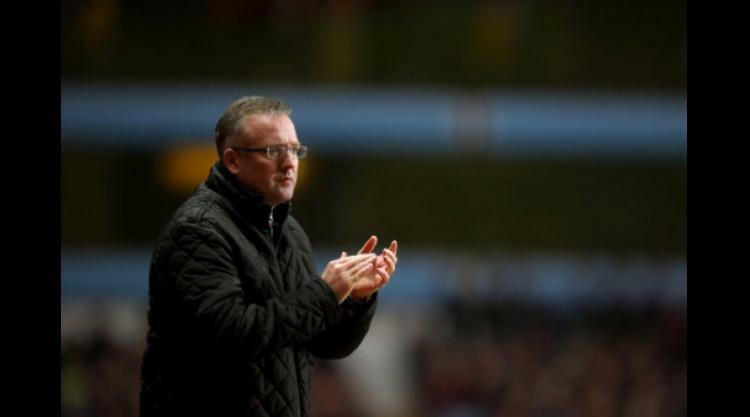 Aston Villa boss Paul Lambert has once again emphasised he does not feel immune from the the sack, insisting he "never stops worrying" about it. Villa are on a poor run of form, having won only one and lost five of their last seven games in all competitions. And last weekend they suffered a 2-1 FA Cup third-round reverse at Villa Park against Sheffield United - a club that have been struggling this term towards the lower end of Sky Bet League One. Lambert - under whom Villa finished 15th in the Premier League last season, his first in charge of the club - said after a 1-1 home draw with Swansea in December that although he has a good relationship with his chairman Randy Lerner, he always works with "that fear" of losing his job. Returning to the theme this week, Lambert said: "I never stop worrying. I'm not immune from it. "The relationship between me and Randy is what it is. You are never immune from anything, and I would never view it that way. "You just keep going - there is no secret formula to it. You just keep going and don't lose focus on what you are trying to do. I will never waver from that." Lambert has also been keen to stress how bad a week he has had off the back of the Sheffield United result. Before the game, he had caused a stir by saying that most fellow top-flight managers would probably prefer to do without the FA Cup. After the match - for which he fielded a first XI showing only four changes - he claimed that comment had been taken out of context. And asked ahead of the Arsenal contest how he had been feeling in the days since the cup tie, Lambert said: "The same way I do after every other game (Villa have lost). "I don't sleep great, I don't eat great. The usual stuff. "It is just the life of a football manager. It is a great job, but you don't feel great (after defeats). "And contrary to other people's reports, I never degraded the competition at all. "I tried to win the game, I put the best team out I possibly could and we got knocked out. Good luck to Sheffield United. We weren't good enough." There were boos from Villa fans at the final whistle in the Sheffield United game and while Lambert has expressed his understanding for the supporters' frustration, he has also called for them to "stick with it" and do all they can to help the team on Monday night. "I don't have any problem with the crowd," Lambert said. "If the team is not performing, then you expect people to vent their frustration - that is normal. "But we are a young side. "Last year, we played Newcastle at home and we were getting beaten 2-0 in the first half. "Then we scored, and for about 40 minutes, it didn't matter what we did, that crowd was right with us. They were brilliant that time. "Because you are in your second year, it might be a different view, but if they can stick with it and see us through the hard times when we need them. because we certainly need them. "They have been excellent for us overall, and we expect if we are not performing that certain things will happen. "But we're hoping on Monday that they will get right behind us." Villa will assess the condition of defenders Ron Vlaar and Nathan Baker ahead of the Arsenal match. Both club captain Vlaar and Baker sat out the Sheffield United game with calf and hamstring problems respectively. Forward Gabriel Agbonlahor, who also missed the cup tie, and goalkeeper Brad Guzan are fit despite having had niggles, but the contest is too soon for midfielder Chris Herd and defender Joe Bennett to make their comebacks after injury.